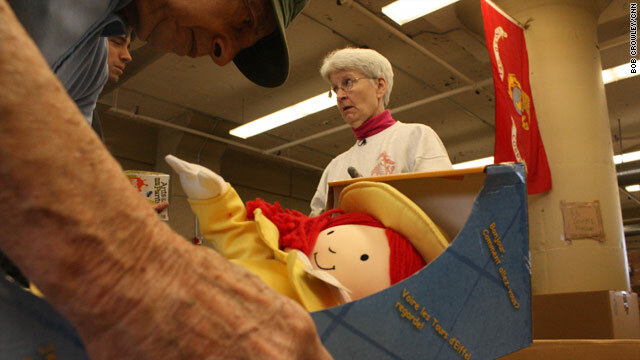 Volunteers Betty Whalen and John Rasuga (foreground) sort through toys in Boston. Boston, Massachusetts (CNN) -- A white van sits at a warehouse loading dock in Boston. Buckled in the front passenger seat is Eeyore, the donkey friend of Winnie the Pooh. "This is the back seat driver," says one of several volunteers removing the stuffed animal and other donated children's items for the local Toys for Tots campaign. The U.S. Marine Corps Reserve program, which began 62 years ago in Los Angeles, California, now gives Christmas presents to underprivileged children in nearly 700 cities and towns across the country. "We're filling orders like crazy," says Kay Carpenter, a volunteer and former Marine. She says that while the local campaign seems to be getting more donations this year, the demand also has risen. "They go out as fast as they come in." As large boxes of toys make their way from the loading dock to the warehouse office, volunteers sort the toys by gender and age group and then fill orders they've received from various charitable organizations in the greater Boston area. "It's been tough for everybody with the economic climate the way it is," says Betty Whalen, a volunteer who works sorting the toys. She points out the empty bins normally used to store the toys. Volunteers won't bother putting new donations in the bins, she says, "because as soon as we sort all of this and start making up orders, it'll be gone." Last year the economy made it tough for many people, and Toys for Tots was hit hard as well. The Boston office did not have enough toys to fill its orders until some last-minute donations arrived. For 2009, Carpenter says, "We've run out of some toys, but overall, we're doing better than last year." Maj. Allen Porter, who runs the Toys for Tots program in the Dallas-Fort Worth, Texas, area, also sees an increased demand this year. But unlike Boston, donations in his area are down. "Compared to where we were at last year," he said, "we are a little bit below." Nationally, corporate cash donations are down significantly, about $1.5 million below where they were this time last year, according to Bill Grein, senior vice president of marketing for Toys for Tots. "That's a lot of presents that we would sure like to have," he said. Last year, Toys for Tots collected or bought 16.2 million toys, books and gifts, down from 16.6 million the year before, Grein said. Most donations to the campaign are toys, but the organization raised about $30 million last year through corporate donations, direct mail, individual contributions and online donations. As an indicator, online donations in November were down 10 to 15 percent from the same time last year, he said. Though the program runs year round, this is the season when larger contributions typically come in. "Every year we count on getting a few Christmas miracles," he said, "So we're hoping that things will pick up now." For some children, getting a toy has an effect on them that carries through after Christmas morning, Grein said. "We think that it's important for children to be able to go back to school and enter into conversation about what they got for Christmas," he said. "It's a self esteem and self confidence issue that we think is very important." Back in Boston, volunteers are taking packaged orders down to the loading dock. Mara Voukidys, from Cambridge Cares About AIDS, watches as her van is loaded with toys. She says for the struggling families who will receive these toys, there is a huge impact. "At least on Christmas they can give their children a Christmas like any child," she said. "So it's been a huge help."